I’ve just spent 50 minutes in the phone with an Apple representative, when the call dropped after being on hold for 15 minutes. The representative was waiting for a senior supporter to be available. 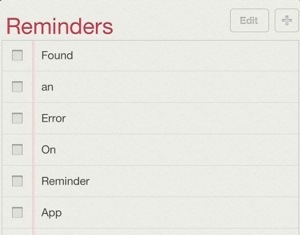 I think I found a behavior error on the Reminders app on iOS 6. When you try to share a note the sharing menu is not available… This seems to be a problem on the computer OS used to do it, because for what I read OSX users don’t seem to have any problem with this. I tested it on a windows computer with two different iCloud accounts and still the problem repeated. Tested with safari and with Chrome with the same result. Here is a link to a PDF I created with the print screen errors, (http://db.tt/oI9mMi3j) in contrast Calendars can be shared without any trouble. I hope somebody at Apple corrects this glitch, thanks! By the way, somebody should explain some manners to Apple support representatives and make sure they call back to the customer if a call drops, I spent USD 6 on the call to them through Skype, at least they could have had the courtesy to call back.